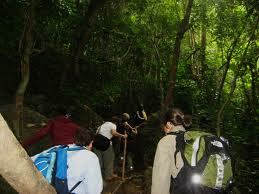 ﻿ Geographically, Cat Ba National Park is located in Cat Hai district, Hai Phong city. Belonging to Cat Ba island, the national park incorporates some of the small islands and marine water and covers 26,300ha, in which 17,300ha is on the main island and 9,000ha is of the adjacent inshore waters. 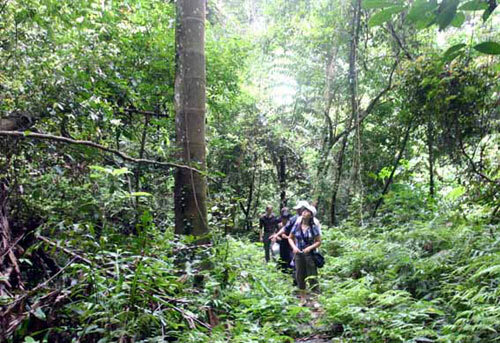 The landscape of Cat Ba National Park is dominated by karst limestone areas on the main island where there are numerous waterfalls, caves and grottoes. 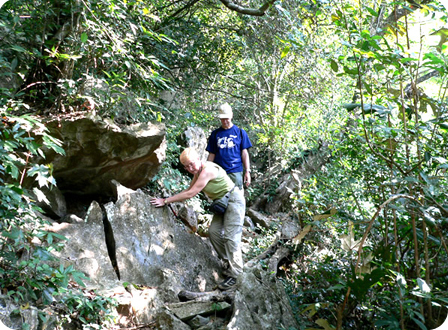 The rugged topography is marked by steep outcrops and bare rock areas with many seasonal streams such as Thung Luong, Treo Com, Hoi Trung Trang and Viet Hai. Most of the rain water flows into caves and grottoes and follows underground streams to the sea. There are several small lakes and ponds in the hills; the largest is Ech Lake- a permanent water body with an area of 3ha and a depth of about 50m. 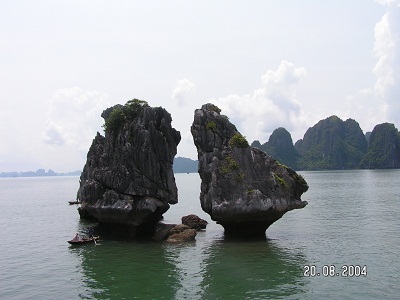 Ninety percent of the main island is between 50m and 200m above sea level, for example Cao Vong (331m) and Hien Hoa (302m), while only 10% of the island is below 50m in elevation. This morning we will depart Hanoi at 8.00am for more than 3 hour driving through the Red River Delta to Ha Long City. On the way, we will stop for taking pictures of Vietnamese farming and refreshments. Upon arriving in Ha Long city we will embark on the calm waters of Ha Long Bay to explore the Bay with thousands of lime-stone mountains and grotto caves. on the sailing to the island, we will stop at crystal water and calm area for swimming, In the afternoon we arrive in Cat Ba Island, transfer from the wharf to hotel, free at the leisure then, dinner in own. Breakfast at the hotel, we then getting to Cat Ba National Park on the way there we will have short break for visiting Military Hospital cave that was used by the North Vietnamese Army during the American war, following is short trek in national park to enjoy panoramic view jungle, afterwards we will return to Cat Ba town, lunch before boarding the one-hour ferry service back to Vietnam’s largest sea port and third largest city of Hai Phong. Arriving in Hai Phong where our vehicle waiting for two hour riding back to Hanoi. Tour ends at the hotel around 06:00 PM.